Enterprises and small-to-medium-sized business environments face escalating data storage needs. In many situations, data must be archived to meet compliance requirements. HPE StoreEver tape storage solutions provide a scalable, reliable, low-cost solution for long-term data storage. The new LTO-7 based HPE StoreEver tape storage solutions make accessing, managing and sharing files on tape as easy as disk. 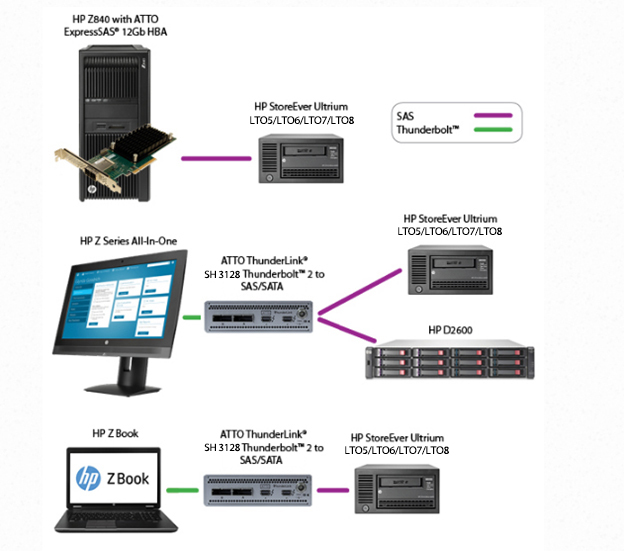 When used in combination with ATTO Technology Inc.'s ExpressSAS® host bus adapters or Thunderbolt™ adapters, they benefit from low-latency, high-bandwidth workstation connectivity to ensure consistent data transfers. ATTO provides connectivity between workstations, mobile workstations and all-in-ones to HPE StoreEver tape storage solutions for Windows® and Mac® operating systems.